The 1992–93 NHL season was the 76th regular season of the National Hockey League. 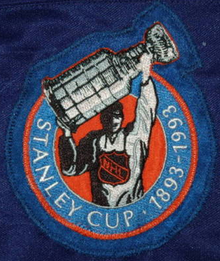 Each player wore a patch on their jersey throughout the 1992–93 regular season and playoffs to commemorate the 100th anniversary of the Stanley Cup. It proved, at the time, to be the highest-scoring regular season in NHL history, as a total of 7,311 goals were scored over 1,008 games for an average of 7.25 per game. Twenty of the twenty-four teams scored three goals or more per game, and only two teams, the Toronto Maple Leafs and the Chicago Blackhawks, allowed fewer than three goals per game. Only 68 shutouts were recorded during the regular season. A record twenty-one players reached the 100-point plateau, while a record fourteen players reached the 50-goal plateau—both records still stand as of the 2018–19 NHL season. The Montreal Canadiens won their league-leading 24th Cup by defeating the Los Angeles Kings four games to one. As of 2018[update], this is the last time that a Canadian team has won the Stanley Cup. This was the final season of the Wales and Campbell Conferences, and the Adams, Patrick, Norris, and Smythe divisions. Both the conferences and the divisions would be renamed to reflect geography rather than the league's history for the following season. This was also the last year (until the 2013 realignment) in which the playoff structure bracketed and seeded teams by division; they would be bracketed and seeded by conference (as in the NBA) for 1993–94. This season saw two new clubs join the league: the Ottawa Senators and the Tampa Bay Lightning. The Senators were the second Ottawa-based NHL franchise (see Ottawa Senators (original)) and brought professional hockey back to Canada's capital, while the Tampa Bay franchise (headed by Hockey Hall of Fame brothers Phil and Tony Esposito) strengthened the NHL's presence in the American Sun Belt, which had first started with the birth of the Los Angeles Kings in 1967. This was also the final season of play for the Minnesota North Stars, before relocating to Dallas, Texas, the following season. Gil Stein was appointed NHL President in the summer of 1992, on an interim basis. On February 1, 1993, Gary Bettman became the first NHL Commissioner. With the expiration of Gil Stein's tenure on July 1, 1993 (note: Bettman's office was created senior to Stein's), the position of President was merged into the position of Commissioner. On March 28, 1993, through a brokered deal with ESPN, ABC begins the first of a two year deal with the National Hockey League to televise six regional Sunday afternoon broadcasts (including the first three Sundays of the playoffs). This marked the first time that regular season National Hockey League games were broadcast on American network television since 1974–75 (when NBC was the NHL's American broadcast television partner). Teemu Selanne of the Winnipeg Jets shattered the rookie scoring record by scoring 76 goals and 56 assists for 132 points this season. He was named the winner of the Calder Memorial Trophy as the NHL Rookie of the Year, and his goals and points marks remain the NHL rookie records as of 2018[update]. The New York Rangers missed the playoffs. This marked the first time since the President's Trophy had been introduced that the previous season's top team missed the next year's playoffs. For the first time in his NHL career, Wayne Gretzky did not finish in the top three in scoring. A back injury limited Gretzky to 45 games in which he scored 65 points. As a part of the 1992 strike settlement, the NHL and Bruce McNall's Multivision Marketing and Public Relations Co. organized 24 regular season games in 15 cities that did not have a franchise, providing as a litmus test for future expansion. Four of the cities chosen – Phoenix, Atlanta, Dallas and Miami – were eventually the sites of expansion or relocations, and although neither Cleveland nor Cincinnati received NHL franchises, there would be one placed in Columbus, located halfway between the two cities. Two arenas that hosted neutral-site games had hosted NHL teams before: Atlanta's The Omni (Atlanta Flames) and Cleveland's Richfield Coliseum (Cleveland Barons). The Hartford-St. Louis game was originally scheduled to be played on December 29, 1992, in Birmingham, Alabama. Manon Rheaume became the first woman to play for a major sports league in North America as she tended goal for the Tampa Bay Lightning in an exhibition game on September 23, 1992, against the St. Louis Blues. The Ottawa Senators and Tampa Bay Lightning were two new teams to be added to the league, bringing the league to 24 teams. Both teams would win their opening games and briefly sit atop their respective Divisions, which led to Harry Neale jokingly proclaiming before the end of Ottawa's first win that both the Senators and Lightning would reach the Stanley Cup finals in May. February 10, 1993: In a 13–1 drubbing of the San Jose Sharks, Calgary Flames goaltender Jeff Reese set NHL records for most points and most assists by a goaltender in one game, with three. Pittsburgh Penguins set the NHL record for longest win streak at 17 games. Conversely, the San Jose Sharks tied the NHL record for longest losing streak at 17 games. June 30, 1992: Eric Lindros traded from Quebec to Philadelphia for Peter Forsberg, Ron Hextall, Mike Ricci, Kerry Huffman, Steve Duchesne, "future considerations" (eventually became enforcer Chris Simon), two first-round draft picks and US$15 million. One of the draft picks was used by the Nordiques to select goaltender Jocelyn Thibault, the other was traded twice and ultimately used by the Washington Capitals to select Nolan Baumgartner. Four of the five remaining helmetless players in the league played their final games: Carlyle, Marsh, Langway, and Wilson. The only remaining helmetless player was Craig McTavish who retired following the 1996–97 season. ^ "1992-93 NHL Summary - Hockey-Reference.com". Hockey-Reference.com. Retrieved 29 March 2018. ^ "1992-93 NHL Goalie Statistics - Hockey-Reference.com". Hockey-Reference.com. Retrieved 29 March 2018. ^ Jim Shea (May 7, 1993). "Select few watching NHL on ABC". Hartford Courant. p. E9. ^ a b c d e Dinger, Ralph, ed. (2011). The National Hockey League Official Guide & Record Book 2012. Dan Diamond & Associates. p. 154. ISBN 9781894801225. ^ MacKinnon, John (February 24, 1993). "Jets take off on Senators". Ottawa Citizen. p. D1. NHL Official Guide & Record Book 1993–94. Toronto, ON: NHL Publishing. 1993. ISBN 978-1-880141-43-4.